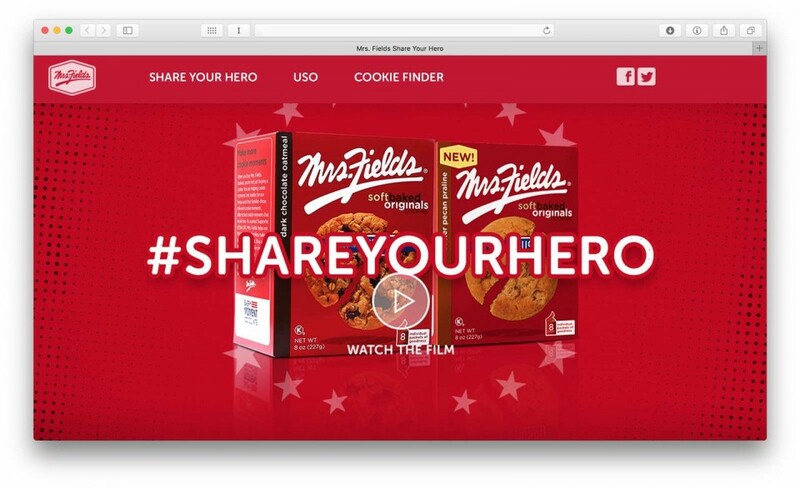 After becoming a licensed baker for Mrs. Fields’ packaged cookies, Interbake Foods was in need of a consumer-focused, digitally driven merchandising platform to reinvigorate the Mrs. Fields brand and drive grocery sales. First, our team established brand positioning to distinguish Mrs. Fields from other packaged cookie brands. Whereas other cookies had cornered the market on being “fun” or a “guilty pleasure,” only Mrs. Fields’ chewy, fresh taste was associated with what mom bakes at home. Invoking consumer associations of Mrs. Fields cookies with homemade treats, our story positioned the brand as a “box of love,” which we supported with a “Mrs. Fields moments” campaign to support the roll-out of Nibblers, a brand-new product, along with a partnership with the USO to support the entire suite of packaged products. To promote the debut of the Nibblers, we created a microsite introducing the Nibblers product along with a coupon and a product locator. We adopted the “box of love” brand positioning for Nibblers as “shareable moments,” leveraging the cookie’s small size as the perfect way to savor and share a moment. We launched a comprehensive blogger outreach program to support this, sending actual “boxes of love” containing everything you might need to create and share a cookie moment, including napkins, milk jugs and straws. In addition, our engagement involved a social/digital coupon gifting campaign to build buzz and encourage sampling, as well as a“Cookies for Keeps” social giveaway that allowed fans to enter to win one of 1,000 boxes of Nibblers by first “liking” the parent brand page and providing an email address to which we could send follow-up marketing messages. To support sales of all of Mrs. Fields’ packaged cookies, we established a year-long partnership with the USO, adapting the “box of love” positioning to be about “Making More Cookie Moments” — a perfect complement to the USO’s ongoing efforts to help troops and their families make every moment count. In addition to a monetary donation to the USO, Mrs. Fields also donated its all-American cookies for use in care packages sent to deployed troops, allowing them to have their own cookie moments even while away. Here at home, we updated the product box design to include the USO logo and updated messaging (“When you buy a box, you’re creating more cookie moments — for you and for them”) and called on families everywhere to create more memorable moments each Sunday night. In addition to product information, our microsite included weekly family conversation starters and a collection of “Sunday Snacktivities” to help families create more cookie moments. The Nibblers Cookies campaign launched in April of 2014 to great success. Our “box of love” blogger care packages were sent to more than 40 bloggers and resulted in over 150 articles and pieces of content seen by more than 2 million readers and 3 million Facebook, Pinterest, Twitter and Instagram followers. Tweets and retweets on Twitter led to 592,102 impressions on that platform alone. On Facebook, our 1,000 boxes “Cookies for Keeps” giveaway is one for the record books: Mrs. Fields saw 119,400 entries in just two weeks, resulting in 45,000 new Facebook. Once users entered the contest, we pointed them to the Nibblers microsite, where they could download a coupon to drive in-store sales — resulting in a 3500% increase in coupon downloads during the giveaway.